Abstract. The spatial resolution of global climate models with interactive aerosol and the observations used to evaluate them is very different. Current models use grid spacings of ∼ 200km, while satellite observations of aerosol use so-called pixels of ∼ 10km. Ground site or airborne observations relate to even smaller spatial scales. We study the errors incurred due to different resolutions by aggregating high-resolution simulations (10km grid spacing) over either the large areas of global model grid boxes ("perfect" model data) or small areas corresponding to the pixels of satellite measurements or the field of view of ground sites ("perfect" observations). 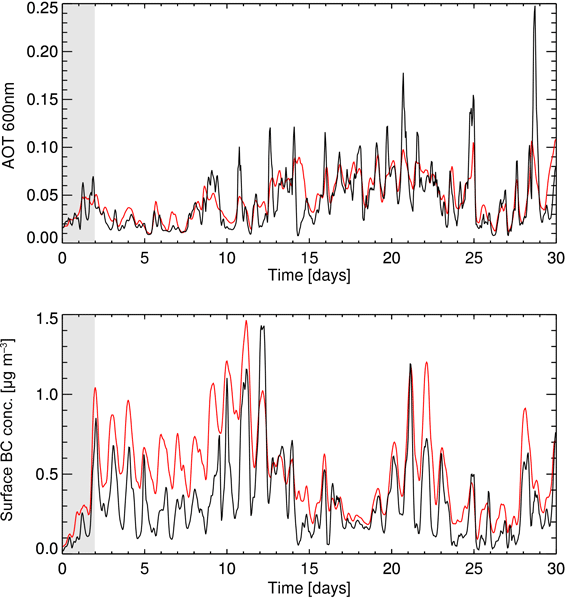 Our analysis suggests that instantaneous root-mean-square (RMS) differences of perfect observations from perfect global models can easily amount to 30–160%, for a range of observables like AOT (aerosol optical thickness), extinction, black carbon mass concentrations, PM2.5, number densities and CCN (cloud condensation nuclei). 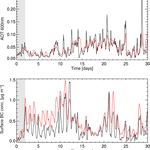 These differences, due entirely to different spatial sampling of models and observations, are often larger than measurement errors in real observations. Temporal averaging over a month of data reduces these differences more strongly for some observables (e.g. a threefold reduction for AOT), than for others (e.g. a twofold reduction for surface black carbon concentrations), but significant RMS differences remain (10–75%). Note that this study ignores the issue of temporal sampling of real observations, which is likely to affect our present monthly error estimates. We examine several other strategies (e.g. spatial aggregation of observations, interpolation of model data) for reducing these differences and show their effectiveness. Finally, we examine consequences for the use of flight campaign data in global model evaluation and show that significant biases may be introduced depending on the flight strategy used. How to cite: Schutgens, N. A. J., Gryspeerdt, E., Weigum, N., Tsyro, S., Goto, D., Schulz, M., and Stier, P.: Will a perfect model agree with perfect observations? The impact of spatial sampling, Atmos. Chem. Phys., 16, 6335-6353, https://doi.org/10.5194/acp-16-6335-2016, 2016. We show that evaluating global aerosol model data with observations of very different spatial scales (200 vs. 10 km) can lead to large discrepancies, solely due to different spatial sampling. Strategies for reducing these sampling errors are developed and tested using a set of high-resolution model simulations.